Welcome to The Abso!ute Sound online! We explore music and the reproduction of music in the home. We believe that the sound of music, unamplified, occurring in a real space is a philosophic absolute against which we may judge the performance of devices designed to reproduce music. Our goal is to provide the resources consumers need to judge how a component's sound either honors or departs from the music's truth, and to make sound purchasing decisions that maximize their experience of reproduced sound. Below is our Issue 175, October 2007 contents and editorial. Neil Gader on the KEF iQ7. 47 Our annual list of the best in hi-fi, in every component category at every price point. Wayne Garcia on the superb Redpoint Model D turntable, Marchand LN-112 phonostage, and Tara Labs Zero GX tonearm cable. Wayne Garcia on a compact, highly musical speaker from Canada. Robert E. Greene on Copland's boundary expanding digital room-correction device. 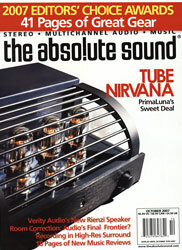 Anthony H. Cordesman on new AC regenerators, line conditioners, and surge protectors from PS Audio. 145 HP's Workshop: HP offers his Editors' Choice picks of the best in high-end audio. 34 Recording the Philharmonic of Russia in High-Res Surround Andrew Quint compares what he heard at two live performances of the National Philharmonic of Russia to recordist extraordinaire Peter McGrath's multichannel mastertapes of the same concerts. 184 Neil Gader interviews Julian Pelchat of Verity Audio.